I recently received a tote full of some fun goodies from Red Heart and immediately fell in love with one of the items inside! 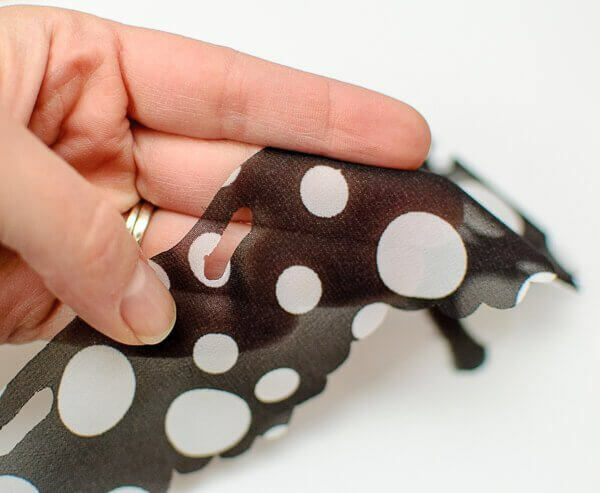 It’s this Boutique Sassy Fabric … isn’t it awesome?! I knew I had to try to come up with a crochet ruffle scarf pattern with it. I played around a bit and here is what I came up with. I worked it along with some coordinating yarn I had laying around. 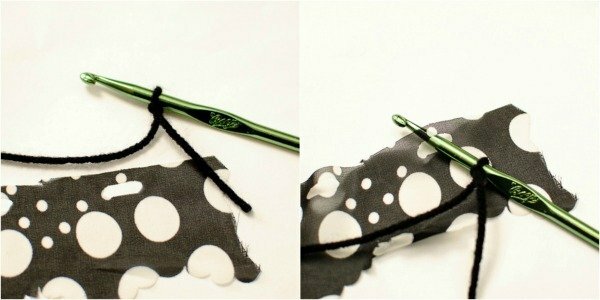 Start with a slip knot on your hook, insert your hook into the first hole of the fabric and pull it through the loop on your hook. 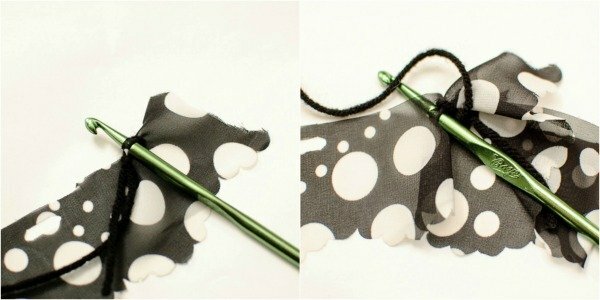 Skip the next 2 holes in the fabric, *then yarn over and bring the yarn through the hole and then through the loop on your hook. Skip the next 2 holes and repeat from * until you have the length you want. That’s it! Pretty easy and fun, huh?! You can even whip up a last minute gift for someone in no time at all. And here is a funny update for you … after writing up this post I went to the Red Heart site to get the links for the Sassy Fabric for you and saw that they have a video on how to crochet with it. Lol, I guess I could have saved myself all the experimentation if I had just gone and checked first. Oh well … it was fun. And now you have two ways to make the scarf. Click here to see Red Heart’s tutorial. 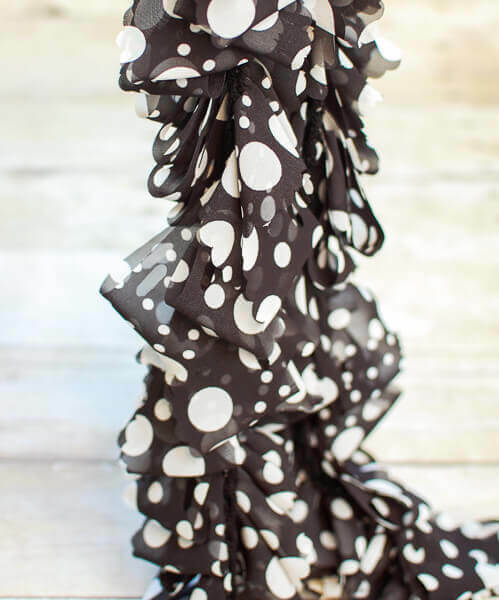 I absolutely love polka dots, love black and white, combined they are wonderful! I was trying to see what size needle you use. And you said skip two holes. Do you skip the two holes and slip stitch into the next hole is that what you mean. Because I really love this scarf. I’m confused about the second set of instructions. Do you yarn over before going into the hole, or do you pick up a loop of yarn after going into the hole? Hop that makes sense! Did it only take one package of fabric to make the scarf, or did it take more? I just did something similar with this Loops and Threads Florence “yarn” from Michael’s. I think I prefer the way the Red Heart fabric loops, though. I’d never seen this fabric before, but now I think I definitely need to give it a try for some fun scarves. This is the perfect “quick to crochet” gift for the feminine woman in your life! LOVE it! Like your outcome better than Red Hearts… theirs looks more like a lei to me..now my friend goes to Jimmy Buffet concerts, so I may make a couple their way for her… but for gifts I would use your method… great easy project and I am thinking of using it for edging on a blanket for myself… thanks for the intro…. Even though I did try it with success via RedHeart video, I’m loving this way too!!! Thanks for the tip using the yarn! I haven’t seen this stuff before! I’ll be on the look out now! 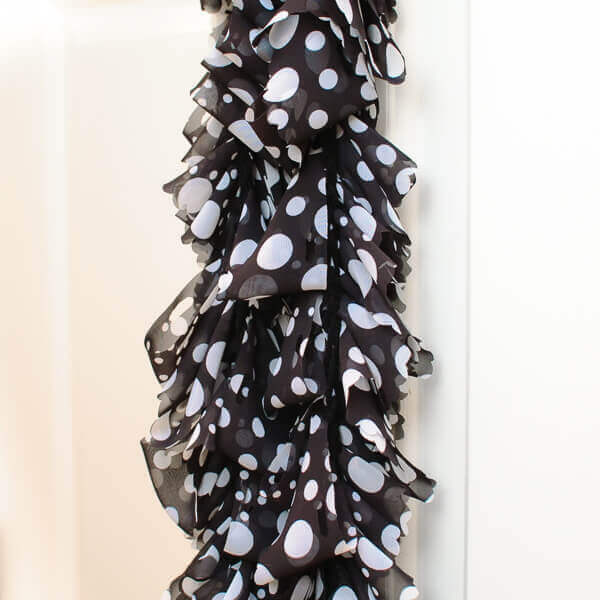 I want to make my daughter a ruffle skirt, this stuff would look even better than the other ruffle yarn I think! Very pretty 🙂 Thanks for sharing your idea. Bought this to make a Christmas gift and made it using the Red Heart instructions. I found that is slipped through itself and wasn’t thrilled with the results. I wish I had thought to do it the way you did. It turned out lovely and was much appreciated by the recipient, but I wasn’t thrilled.